Think like an Olympic athlete and get your own gold medal! What drives an Olympic athlete? Where do they gain the strength to maintain their focus, better their personal best and go on to win an Olympic medal? What words does an Olympic athlete use to maintain an inner self-belief? Watching the Olympic Games in Sochi this month I have thought about the Olympic Games that London hosted two years ago. Many athletes, like Rebecca Adlington, Ben Ainslie, Sir Chris Hoy and Victoria Pendleton have since retired but does their drive and focus still live on? As one of the two women who share the record as Great Britain’s most decorated female Olympians, Rebecca Adlington has won a host of medals. The most well-known being the 2 Gold medals she won at the 2008 Beijing Olympics and 2 Bronze medals at the 2012 London Olympics. She also has gained a number of distinctions, including an OBE and her local baths were renamed the Rebecca Adlington Swimming Centre in honour of her success. Rebecca Adlington did an interview with the Telegraph recently about her time on “ I’m a Celebrity get me out of here!” She talks openly about the pressure she was under and how she broke down in the jungle about her own looks by comparing herself to other women. We all have moments of self-doubt and there are times when we all are vulnerable, we compare ourselves to others and we lose a little belief in ourselves. However on reading @BeckAdlington‘s daily tweets it is clear that Rebecca must still have a strong inner-belief that helps her remain positive. I’m sure Rebecca must draw strength from her time as an Olympic athlete and that her inner self-belief is still strong as she launched SwimStars last year in four cities throughout the UK. SwimStars has a reward scheme that acknowledges achievements in the water as well as an incentive to learn about the behaviours and values that are important to being the best you can be as a swimmer AND as a person. 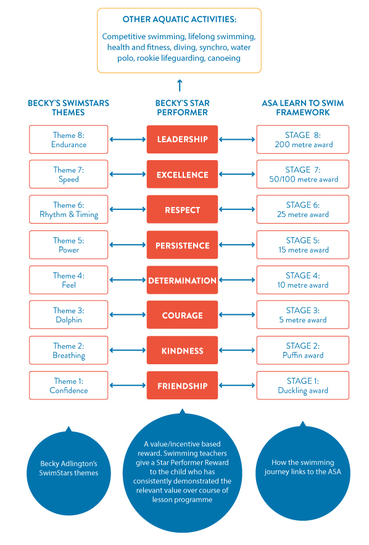 As seen in the image below, Rebecca’s values are aligned with the ASA framework. Rebecca stands out as being one of many Olympic athletes who seeks to inspire others through what she is now doing. She understands what it is like to be faced with challenges as well as the importance that finding that inner self-belief to stay strong and focussed. At the age of 25 she is already considered to be “retired” but this certainly doesn’t mean she is out of the limelight or the water! What lives on is the inspiration that she is to many young swimmers and others. If you were to think like an Olympic athlete what would you say? How often would you repeat those words? And when would those words turn to self-belief? What will your motto be? What will your daily incantation be? In my book “Satnav for the Soul”, I discuss how repetition causes an incantation, or a motto, to become a thought inside that becomes a habit. Incantation is a phrase or language pattern that is said out loud, using energy and engaging your body. To keep us going and motivated, we all need to find our incantation so we can go on to achieve our own fulfilment and success. It is proven that if something is consistently done for 21 days it becomes a habit. I’m not an Olympic swimmer but I can imagine that the Olympic motto “Faster, Higher, Stronger” goes through many athletes minds when competing and that they each have their own daily incantation. It may be a daily ritual, a song, a prayer or a saying. The more consistently you can declare, feel and experience this new belief, the more identity and ownership you will have of it until eventually it becomes your own true self-belief. Create your own daily incantation that weaves a little magic so it can help lift your spirits when feeling low. Let it ignite your passion and become part of you – an inner self-belief. February is the month of “love”. We are constantly told this in the lead up to Valentine’s Day and reminded of it on the radio, TV adverts, signs on shop windows, twitter feeds. It’s everywhere you look on February 14th – Cupid cardboard cut-outs, flowers, hearts, couples in restaurants, people hugging, red balloons, heart-shaped chocolates! It even pops up on the Google search engine. Image courtesy of Google, 2014. You can’t really ignore it unless you happen to hide away for the first fortnight in February. 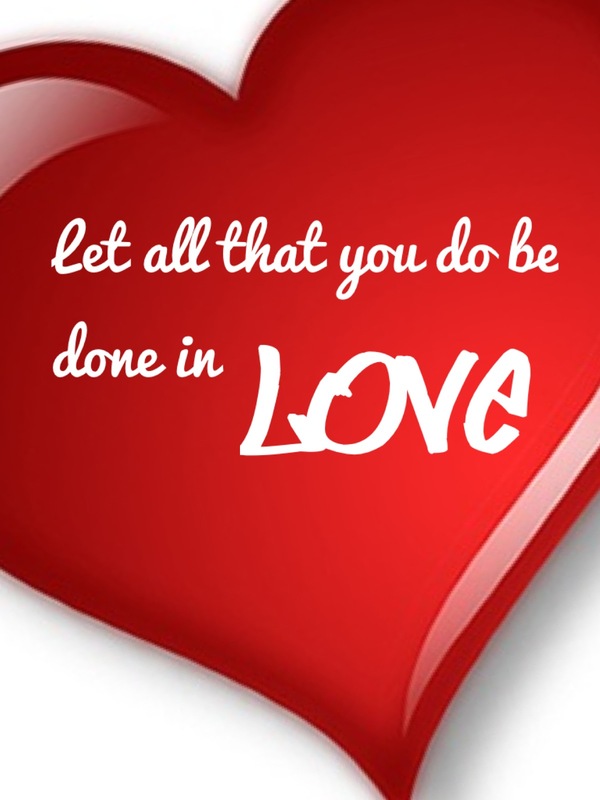 However when Valentine’s Day is over for another year we shouldn’t just shut our eyes or our hearts to love. Love doesn’t just happen in February! Love is for every day, every moment. I have mentioned before in my blog about 10 actions you need to do for yourself and particularly about the importance of loving yourself. I still believe it to be true that it IS possible to take care of your own needs while also caring for those around you at the same time. In fact once your needs are met you will be far more capable of helping those who need you most! It is really important that you love yourself first. Why should you be first? Do you really expect others to believe that you love them when you do not love yourself? You cannot be egotistical when it comes to love. You are not so different or special that you can show love to others but not to yourself. So put aside any thoughts you have about where love comes from or what you are looking for in love and stop overlooking the one person who needs love the most! Love doesn’t happen by accident. There are two things that I want you to do right NOW! 1. Write down 3 things that you love about yourself! Place this piece of paper in a place where you will look at it EVERY day until the end of February. Love yourself and be completely at ease about loving yourself!